On the industrial southwestern edge of Phoenix where the city bumps up against farmland, Great Blue Herons, beavers and bobcats roam the Tres Rios Wetlands, a man-made 500-acre wildlife haven. It would be nice to imagine that Tres Rios Wetlands Project with the Estrella Mountains as a backdrop was built by Phoenix as a refuge for the native trees, wetland vegetation and animals. While that’s an important feature, it’s a byproduct. Tres Rios was built as an efficient method to remove nitrogen from the wastewater flowing from the sewage treatment plant next door. Natural wetlands, sometimes called marshes or riparian areas, are found all over the world and help to control floods and provide habitat to a wide variety of animals and water-rooted plants and trees. Farms fields and developments have been built over many natural wetlands. The U.S. Environmental Protection Agency reports there are about 1,000 manmade wetlands operating nationwide, most in the southwest where reclaiming wastewater is a top priority. 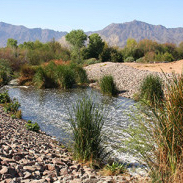 In 2009, Tres Rios was created out of vacant farmland along the Salt River bed. Everyday an average of 78 million gallons of treated wastewater flows through Tres Rios Wetlands from the neighboring 91st Avenue Wastewater Treatment Plant and into the Salt River. Farmers downstream of the flow use the reclaimed water for irrigating non-edible crops, such as cotton. Tres Rios Wetlands is a vibrant wildlife site where native trees and water-rooted grasses attract birds and mammals. The site also attracts photographers, researchers and school kids. Creating the wetlands had its challenges, such as learning to regulate the flow of water to support wildlife, to eradicate invasive species such as Tamarisk trees, and to control mosquitoes. Special mosquito-eating fish, a balance of birds and bats, environmentally friendly chemical agents and diligent monitoring now control the pests.